Prana Music Group would like to welcome Bachaco to our roster and is excited to announce our partnership! We are honored to bring this talented group of revolutionaries to the airwaves and a stage near you! BACHACO was conceived and founded by Venezuelan brothers Edilberto ‘Eddy’ Morillo, lead vocals, and Jose Morillo, bass and vocals, in Miami, Florida where they met the rest of the band and lineup. The band’s diversity makes BACHACO a true multi-cultural experience. Their music naturally flows in English and Spanish but the true language BACHACO speaks is the vibe they transmit: High Energy Groove! BACHACO’s Reggae Rock and Latin Roots sounds perfectly blend feel-good Reggae Music with conscious lyrics and party jams to the beat of their own Afro-Caribbean Roots Rock, inspired by new and the classic sounds of Bob Marley songs, Latin Music and California Reggae. 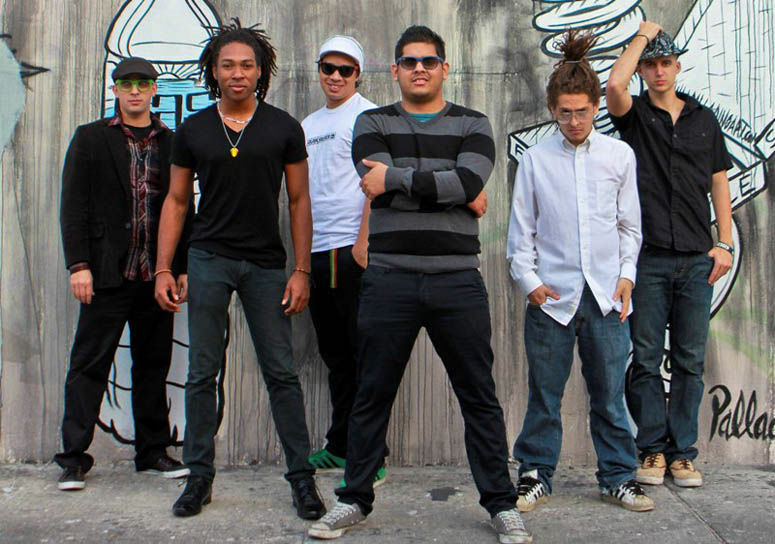 The band’s hit Singles “Good Morning“, “Sunfire Girl” and “Keep Your Head Up” are BACHACO’s Best Reggae Songs. Their New Reggae Songs will make you groove and have you jammin’ every track as each flows with its own influences of Dancehall, Ska, Rock, Hip-Hop, Dub and Latin Reggae. Since 2007 BACHACO has performed over 300 concerts from Argentina to Canada and completed two North American tours in 2015 and 2016. Bachaco has shared the stage and performed with other big names in the reggae and world music scenes such as Stephen Marley and the Marley Brothers, Natiruts from Brazil, Israel Vibration, Toots & The Maytals, Tribal Seeds, Ozomatli, Luciano, Easy Star All-stars, Midnite, Cultura Profetica, Gondwana, Los Cafres, Los Pericos, Bahiano, Alika, Jarabe de Palo, Los Amigos Invisibles, WAR, King Chango and many more. BACHACO has also showcased during the SXSW and LAMC music conferences thanks to the support from BMI. BACHACO’s 2012 self-titled debut album which includes the Latin Roots Hit Singles ‘Jamaican Cumbia’ ‘Cumbia Pa’ La Nena’ and ‘Ni Una Lagrima’ has been featured on MTV Tr3s, MTV Latin America, CNN en Español, Telemundo, iTunes ‘New and Noteworthy’, Sirius XM Radio, About.com, MSN Latinzine, BMI.com, Gibson.com, AOL Radio’s Rock Latino Top 10, Terra.com, ZUMBA, Venevision Internacional, Miami New Times, Miami.com, El Nuevo Herald (Miami), Viernes Magazine (Miami) Batanga.com, Boom Magazine (Miami), LatinRapper.com, VIPLatino.com, Inity Weekly (Colorado), Brightest Young Things (DC), Reven Magazine (South Carolina), Que Pasa Mi Gente (Charlotte), Nativo Rock (Orlando), The Atlantic Current (South Florida), RCKLG (Argentina), Guacamaya FM (Nicaragua), Rio Live Reggae Radio (Ecuador), KeysWeekly.com (Key West), Remezcla, PulsoBeat.com, ItsInMiami.com, YardHype.com, PuertoRicoUnder.com and many other media outlets througout the U.S. and abroad. In 2014, Concert Channel Sessions broadcasted BACHACO Live from Hollywood, California during Prime Time for over 20 countries including: Argentina, Aruba, Brazil, Chile, Colombia, Costa Rica, Dominican Republic, El Salvador, Mexico, Panama, Peru, Trinidad, Uruguay, and Venezuela. Telemundo’s “Premios Tu Mundo” 2014 awarded the band a Gibson Sponsorship on National TV for winning Budlight’s “Buscando Mi Ritmo” Live Music Reality TV Summer Series with their Upcoming Latin Dancehall Single “Tú” featuring international Telenovela Rockstar “Joseguillermo” Cortines from Dominican Republic which released in 2015. What is a BACHACO? The word BACHACO is the name given to a Leafcutter Ant in Venezuela. The same type of ant is found across the Amazon Rainforest and in countries such as Panama, Colombia, Venezuela and Brazil. The insect is used by Venezuelan indians to create a ‘picante’ (hot sauce). We could say BACHACO is a musical PICANTE. Please help us welcome Bachaco to the family at Prana Music Group!